A Welsh girl in Australia: "You like vinegar in your salad don't you?" "You like vinegar in your salad don't you?" This morning as I was showering my girl headed downstairs for breakfast. and had prepared mine too. some feta cheese that she didn't want to cut (as it was slimy), vinegar - Malt vinegar? No words needed....just a thank you cuddle. Hi Beth..it looks like you were spoiled this morning by your lovely daughter! Sorry I haven't been over in a few days, I have just caught up..bananas haven't been on my shopping list lately either..and the shoes are wonderful. That's awfully good of her to prepare the food for you. I wonder how many times she's been eating salad with vinegar?! 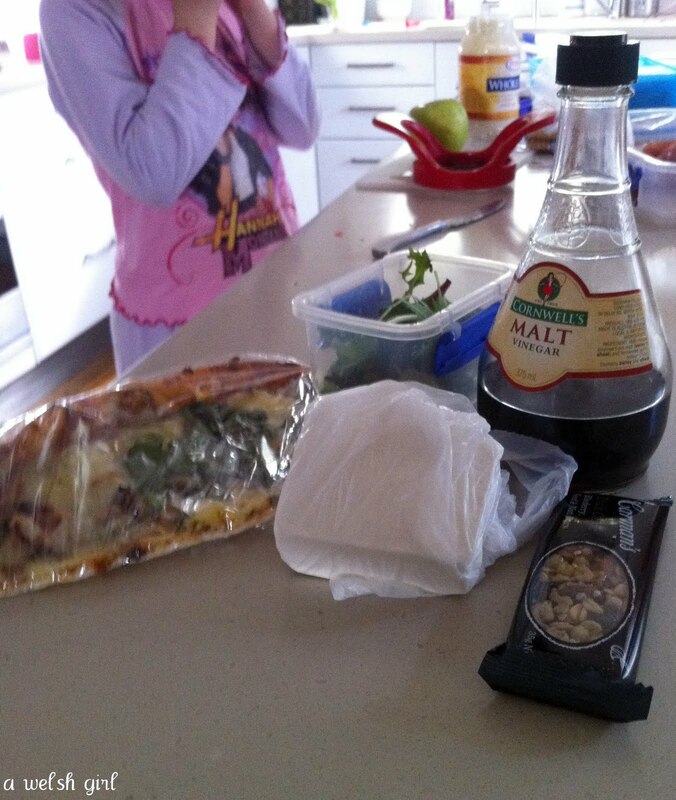 I must try some malt vinegar on my salad. Ha! Sibs is an excellent helper. I only get food made from sand or playdough. Reminds me of when my husband put balsamic vinegar in the water to poach eggs, so we had purplish eggs for breakfast. HaHa! Great lunch. Packed with love. I'll put my order in now for mine, just hold the vinegar darling! "It's the thought that counts" right! Love the story. Can't wait for the day when my two little helpers start to "help out". I'm sure they will come up with a treat or two LOL.